A thermochron is a neat little programmable device that looks like a watch battery. It contains a temperature sensor, a real-time clock, and some memory for data storage. I currently own three of these devices that I use for monitoring temperatures around my home near Boston. Once a week I collect the data from the devices and make plots using SLxfig. 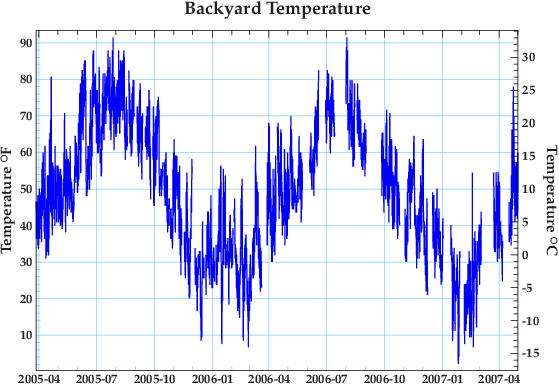 Here are some plots of the data from one of the thermochrons located out of the sun in my backyard. This particular thermochron is programmed to sample the temperature every 6 minutes.